So, you want to spin those hamstrings into a frenzy, but it's raining cats and dogs? That's cool: there is an answer and it comes in the form of the best exercise bikes (or you may prefer an indoor turbo trainer if you're a hardened MAMIL). There's nothing like a long and arduous pedal session for absolutely blitzing fat, building up Chris Hoy ham hock legs and constructing a superhuman heart. So whether you're looking to recreate a stage of the Tour de France or just spend 20 minutes in the fat-burn zone to help you lose weight faster, there's something in this collection of stationery speed machines for you. What is the best exercise bike? That'll be the Wattbike Atom, which not only looks good enough to ride out on the next sportive, if only it had wheels, but also provides one of the most realistic training experiences around. From the thin, Tour de France-style saddle to the triathlon 'out-front' bars, this feels like the real deal, while Wattbike's superior built-in sensors offer valuable feedback, with cadence, power output, heart rate and pedal stroke analysis just a few of the numbers to pore over whilst enjoying a nice recovery shake. Compatibility with Zwift's virtual training software means you can join online clubs for inspiring group rides, challenge virtual riders to competitions or simply pedal around attractive 3D environments. You may never leave your training room ever again. The first thing to know about exercise bikes is that the cheaper ones are not all that much like riding a real bike. High end simulator options like the Wattbike and Proform are the exception not the rule. You may want to consider a smart (turbo) trainer if you require a more 'realistic' experience without spending several thousand pounds. Most modern exercise bikes use a brake-based system that sees a heavy metal flywheel turned by the pedals and chain, rather than a rear wheel. Resistance is added in cheaper models by braking this flywheel as you would on a moving vehicle. Up till recently, it doesn't yet come cheap, but don't worry if you don't have a budget the size of a Tour de France team's drugs bill. There are bikes out there that start from as little as £199 and do the job; just don't expect them to deliver an ultra-realistic riding experience. Other than price, the main decision you will need to make is riding position, be it recumbent (basically laying down) or varying levels of upright. The former is great for anyone with back problems, who perhaps doesn't want to be hunched over like Bradley Wiggins attacking a time trial, while the latter does its best to replicate a real outdoor cycling experience. Depending on where the handles sit in relation to the saddle, this could mean a racing type posture or a more fully upright, Boris Bike kind of affair. These things do command a decent amount of space at home. But even if you haven't a clue what cadence means, nor care for Lycra-clad jaunts at the weekend, one of these pedal-powered beauties could be the difference between you smashing your 2019 fitness goals or slowing sliding into couch potato land. Wattbike has long been the master of creating professional grade indoor cycling equipment that offers more feedback than a heavy metal concert in a wardrobe, but now it has turned its attention to the private home market. The Atom condenses all of the sensors and technical nous of the standard, gym-dwelling Wattbike into one very stylish package, designed to take on the increasingly popular new breed of smart turbo trainers. The Atom's lightweight steel construction makes it easy to move around, while the compact frame ensures it doesn't take up too much space at home. It still feels more like a real, high-performance road bike than most of its rivals. It's got a thin, lightweight racing saddle, authentic drop bars with rubber gear cowling and 'out-front' time trial bar extensions. The realism doesn't stop there, because when plugged in and synched up to a smart device, it shows off its fancy, innovative Climb Mode, which automatically adjusts resistance when connected to virtual training software. So when you hit a hill during a Zwift session, the resistance ramps up to match. Wattbike's own, detailed app measures 37 different riding metrics, which can be displayed on a smartphone or tablet (there's a neat holder for that) while training. The price tag might seem a bit steep, but it's much less than the original Wattbike, and comparable to top-end turbo trainers. Just like the spin bikes you have likely encountered in a fitness studio, the Bodymax B2 harnesses the power of a heavy 13kg flyweight and a brake shoe to crank up the resistance. This mechanism makes it brilliant for tackling punishing High Intensity Interval Training regimes or hosting your very own spin class at home, as the resistance is piled on quickly and easily, while the torque output (and therefore effort) of the individual goes way beyond a standard chain-driven bike. It's arguably not the most realistic form of indoor cycling around but the overall package represents excellent value of money, with a neat LCD monitor included that gives speed, RPM, distance, time, calorie and pulse readouts when a compatible heart rate monitor is worn. -It's not really cycling, is it? Okay, so this isn't your typical exercise bike but what it lacks in conventional styling, it more than makes up for with a punishing workout that targets multiple muscle groups. 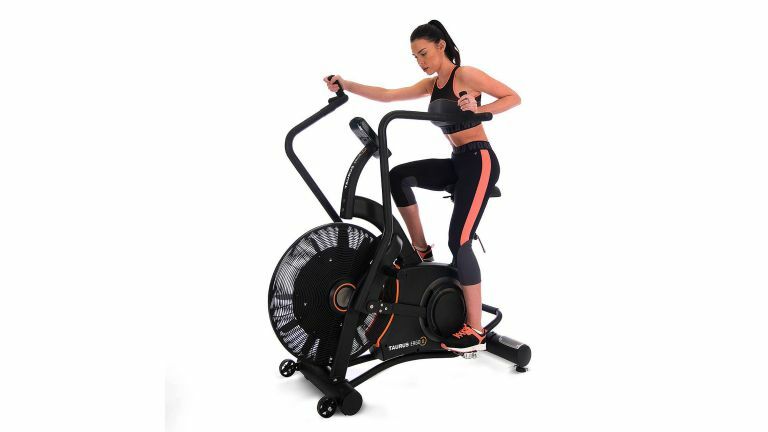 The Ergo-X uses belt drive fan resistance, which essentially means the harder you work, the more it cranks up the resistance level to fight back and make the workout even harder. Plenty of professional athletes can be seen using a similar contraption to warm up before hitting the sports field, simply because it works a great selection of muscle groups. We're not saying this will make you a professional athlete, but it will assist you in nailing those daily HIIT targets. The Wattbike Trainer is the Atom's big bro', and many professionals' choice. That's because it's a precise training tool that's arguably the closest you can get to real road riding without leaving the comfort of your living room. Firstly, the machine is set up to resemble a real, lightweight race bike. So it comes with a razor thin saddle, strap-in pedals (that can be easily swapped for road cleats), drop handlebars and 'out-front' time-trial style grips. All of the above can be adjusted and fettled to suit the individual rider and once comfortable, the clever combination of dual air and magnetic braking means every revolution of the crank feels mighty realistic. Wattbike plays nice with any apps and wearable technology that is ANT+, Bluetooth, FE-C and Wi-Fi compatible, meaning it's easy to sync your heart rate monitor, it works with those smart pedals and allows you to sift through the reams of data at the end of each workout. Even without add-ons, the Wattbike produces plenty of stats. Its power readouts, which work between 0-3760W, are some of the most accurate on the market. Patented Polar View technology also regales the rider with information on each individual pedal stroke, so ultra-keen cyclists can improve pedalling efficiency and power output. Two-wheeled geekery aside, this thing makes a top notch exercise bike for even the casual user, with simple resistance adjustment at the front of the machine, plenty of adjustability to suit all body shapes and an easy-to-use interface that can be as detailed or as simple as the user requires. Please note that Wattbike makes two variants of its bike: the Trainer and trainer Pro. The only difference between them is that the Pro has higher resistance and is, as its name suggests, aimed at more elite athletes. Offering one of the most realistic riding experiences around, this cycling simulator from Proform is impressively detailed. Not only is it laid out like a traditional racing bike – slimline saddle, drop handlebars and dual water bottle cages – it can also replicate the rush of a steep incline or decline with an automatic grade simulator of up to 20 per cent in either direction. The patented Silent Magnetic Resistance drive system is one of the quietest around, especially when compared to noisy air trainers, while the pedal motion is smooth and realistic. The 10-inch touchscreen console delivers detailed statistics, as well as hosting numerous fitness apps, while HD training videos can be called up for those who want to feel like they are battling the Alpe d'Huez while the kids watch CBeebies in the other room. Designed with the more relaxed rider in mind, this recumbent machine from NordicTrack features an adjustable, lumbar-supporting seat, easy-to-reach bottle holders and a comfortable cycling position that takes the strain away from the lower back. Don't think it won't encourage a sweaty session though, because there are 26 digital resistance levels and 32 workout programmes to choose from via the bright, 7-inch LCD display. It's also iFit compatible, though you will have to pay extra to actually use it. Heart rate monitoring comes via the handlebars. A USB port allows iOS users to plug in their phones, for music playback via the built-in speakers. Pumping the soundtrack from Rocky just got a whole lot easier. If you prefer the exercise bikes in your local gym to the more modern, stripped down spin bike, then you're going to love the Forma. It's as close to a gym bike as one can get for the home. That means a smooth, adjustable seat that's easy to move with one hand, automatic data tracking via the on-board computer and ergonomically designed handlebars that replicate standard, city and racing bikes. Technogym's operating system is extremely intuitive and simple to use. Fire up a bespoke app, scan the QR code on a machine and data from previous workouts, favourite settings and training programmes are transferred between devices.